This park surrounds the Alice Marble Tennis Courts (2 doubles, 2 singles, and a hitting wall) and a basketball court. It contains trees and shrubs, paths, stairways, and benches. There are lovely vistas of the Golden Gate Bridge. Recent improvements have been completed by Friends of Sterling Park. This park is owned by the SFPUC - Water Department. 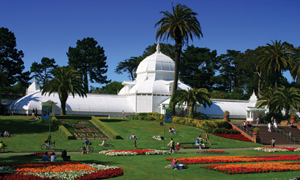 The tennis and basketball courts are maintained by the San Francisco Recreation and Parks Department. The park's namesake was a well-known poet of the early twentieth century, one of the leaders of San Francisco's artistic Bohemian colony. The park is dedicated to the late poet George Sterling (1869-1926). First named George Sterling Glade in 1928, its only bench cracked in the 1960s and the original plaque was stolen in the 1970s. In 1982, a new plaque was installed at a ceremony attended by the city's literati. In November 2005, the park was rededicated as Sterling Park and a new plaque was installed.